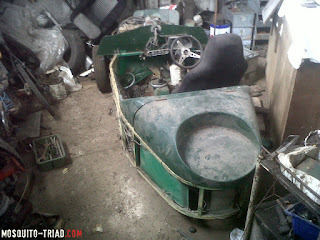 Summer is a little quiet for the Mosquito & Triad Register... Joe sent me a few pictures of his work on his Triad. BWP606M is back on wheels! I've received a few pictures from Dave who restores BWP606M. 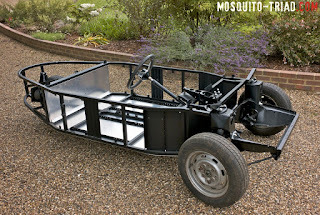 As usual, he's done a great job and I'm sure his Mosquito will look great! I've received a new picture of Q380VAB, which is a red Triad Sport. 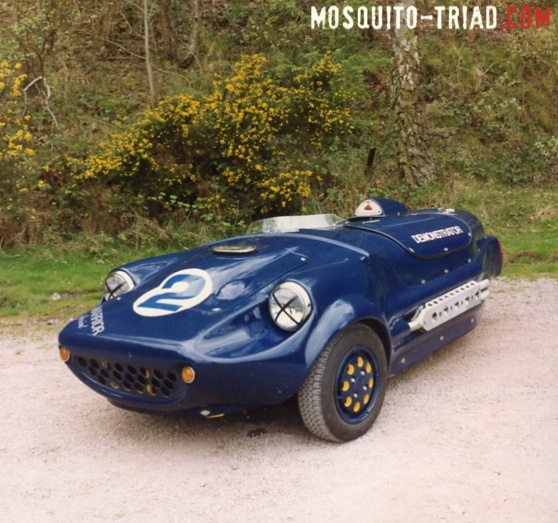 June, a lucky month for the Mosquito & Triad Register! June seems to be a busy month for the Mosquito & Triad Register! Thanks to some enthusiasts, I've received informations and pictures of some missing cars. Then, I've also received informations about two Mosquitos I heard about 4 years ago but I never succeed in getting pictures of them or informations. These Mosquitos are GWL208S and GWL608S. 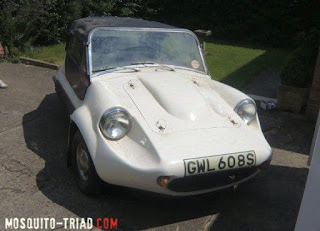 I've learnt that GWL208S had been sold a few years ago and nobody knows what happened to it then. I've received an email with pictures of Q827LFL. I was so sad to discover that it's been crashed. The actual owner is planning to restore it. 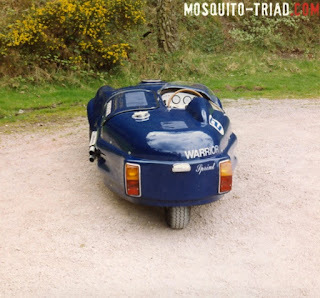 He first planned to fit a motorbike engine on the rear end but after visiting the Mosquito & Triad Register, he doesn't know what to do now... He now thinks it would be a shame to modify it. I've just received new pictures from Dave and his Mosquito. Dave is the owner of BWP606M and is actually doing a great job on it as he has completely rebuilt the chassis from scratch. 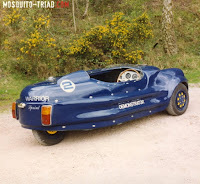 Have a look at the pictures, it's nearly better than when it's been built, back in 1974! 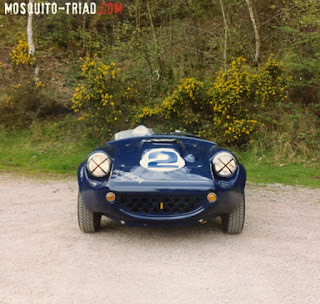 It's not a Mosquito but this car has to be mentioned on this website. Thanks to Morgan Cars for reinventing this wondeful car! I've seen it yesterday at the Geneva Motor Show, it's such a nice car! 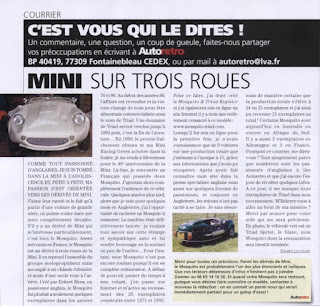 Last month, the French magazine Auto Retro published an article about the Mosquito and the website Mosquito and Triad Register. For those who didn't have the mag, I've put a copy in the "literature" page. I’ve received a message from Colin, an English visitor. I want to thank him for that. A friend of him was involved in the building of this car. Thanks to Colin, I now have two more pictures of the Demonstrator. Unfortunately, it seems that Colin and his friend don’t know what happened to this car next. Two pictures have been added to the restoration page of my Mosquito. You can have a look at it by clicking here. 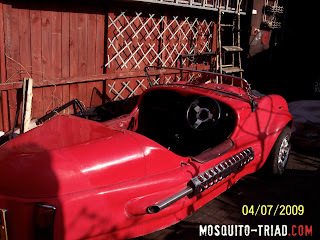 The Mosquito & Triad Register was created 4 years ago now! I've just added a blog to this website to celebrate this birthday. It will be easier to communicate with all of you! If you subscribe to this blog, you'll be informed of the updates and you'll get news from the Mosquito & Triad Register! If you have any information to give me, leave a comment on this blog and please, feel free to join us!